1. 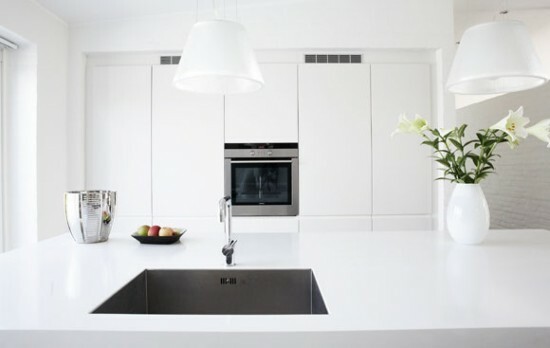 Cabinetry | White Cabinetry and dark(er) natural woods like walnut and mahogany. Gone are hyper detailed and overwrought fussy looking cabinets, replaced by full overlay slab panel door and drawer fronts. 2. Counter tops | Light colored Quartz and marble counter tops – particularly Calcutta Gold marble. We are using less granite, especially multi-tonal heavily veined granites. If we do use granite, it has been honed or flamed and not polished. 3. Hardware | Decorative pulls are on their way out with finger pulls becoming the more popular choice. These can be pulls that are cut into the lip of the panel or small finger grabs that lay on top of the door. Either way, the goal is to produce less visual clutter. 4. Stainless Steel Appliances| Did these ever go away? 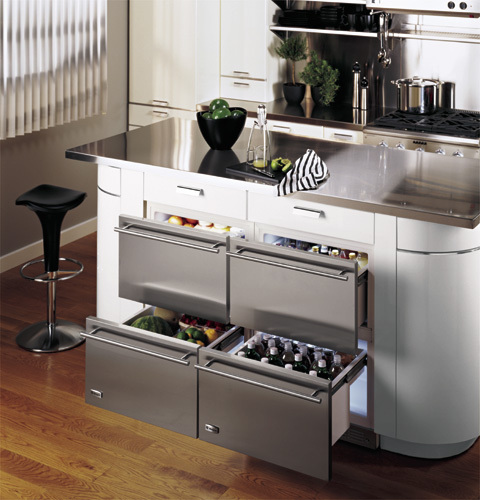 Name brands are still the name of the game, Sub-Zero, Viking, Dacor, Miele, and GE Monogram. If you ever needed proof of these brand popularity, look at the real estate section of the newspaper and see how many homes list these brands by name as selling points. They are high quality, function extremely well and add long term value. 5. 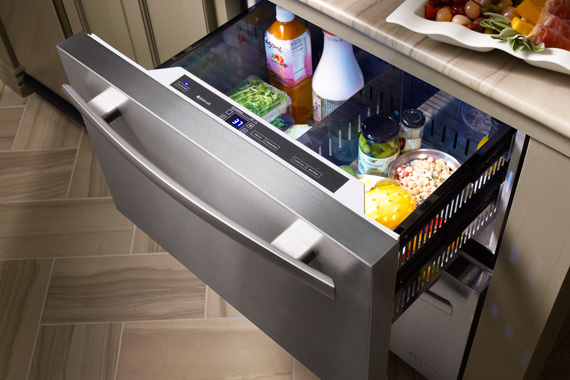 Integrated appliances | dishwasher drawers for small loads, and under-counter refrigerators (like the awesome Sub-Zero 700BR) for specialty work zones. 6. The Social Kitchen | Very large islands and the demise (or at least the very reduced capacity) of the table in the kitchen. 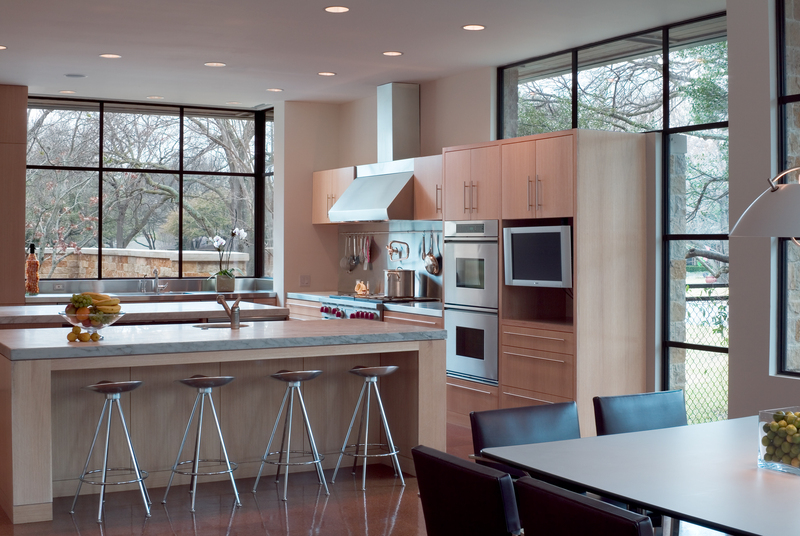 Our kitchen designs are incorporating large island(s) that can accommodate cooking, prep work, and dining. The area previously reserved for the breakfast table has been replaced with a sitting area in the kitchen. The large over-scaled island provides an area for your kids to spread out their homework and projects and still give mom and dad a place to prepare the meal in a social and spacious manner. 7. Stainless Steel Finishes | The request for easy to clean, industrial materials in the kitchen is on the rise – this means more stainless steel countertops and back-splashes. It is becoming easier to incorporate stainless steel into a complete house finish package now that more and more faucet manufacturers offering up stainless as an option. 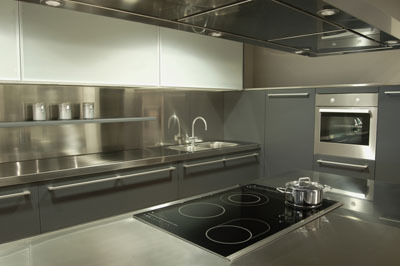 Be aware, stainless steel does scratch – all metals do – but eventually, the scratches become a finish within themselves. I do think that this is one of those materials that all interior designers stay away from and architects embrace. I don’t know why it just seems that way. 8. Integrated sink tops | it seemed inevitable. 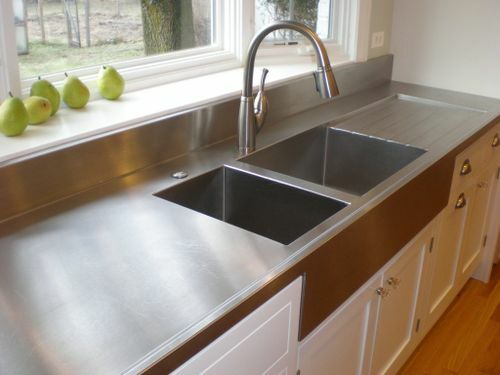 As soon as stainless steel became a countertop option, custom fabricating integral sinks into the counter was the logical next step. Available options, including the number of bowls, depths, sizes, built-in drain boards, etc. make this a fun and fluid material to work with. 9. Horizontally oriented grain | sometimes all it takes is a slight adjustment to a well-known material to introduce a fresh new look. Part of the reason this trend is starting to become more popular is the introduction of the open floor plan back into the modern kitchen. 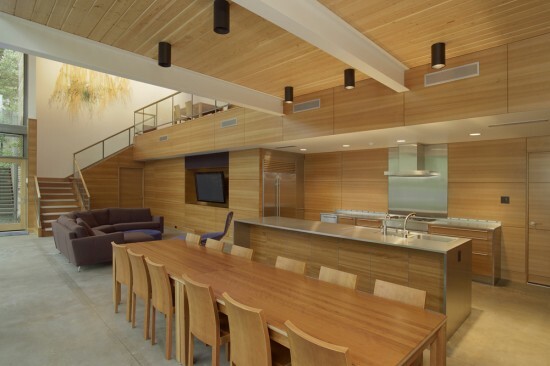 The grain extends the space visually and integrates what was previously just a utilitarian space with its own personality into the same finish palette as the main living areas. 10. The removal of decorative pendant lighting| pendant lighting suspending down over the kitchen island is hopefully going away. At one time, decorative pendant lighting served as a visual cue to stop your eye, giving you something to focus on and contain the working kitchen area from the eating kitchen area. Now that we have multi-purpose rooms and kitchens no longer have to be tucked in between the Garage and the Dining room, we don’t want your eye to stop at the island. Kitchen design trends change fairly rapidly but most of the items on this list have been developing and refining for years. Despite the hype, kitchens don’t come into favor or go out of style in a year – if they do, I think you have a bad design on your hands. Yes, I know that I called this list the Top10 Modern Kitchen Trends, but I hope that this list represents more than a trend. Trend … that makes it sound so irrelevant and transitory – two words that I strive to avoid using when describing my work.